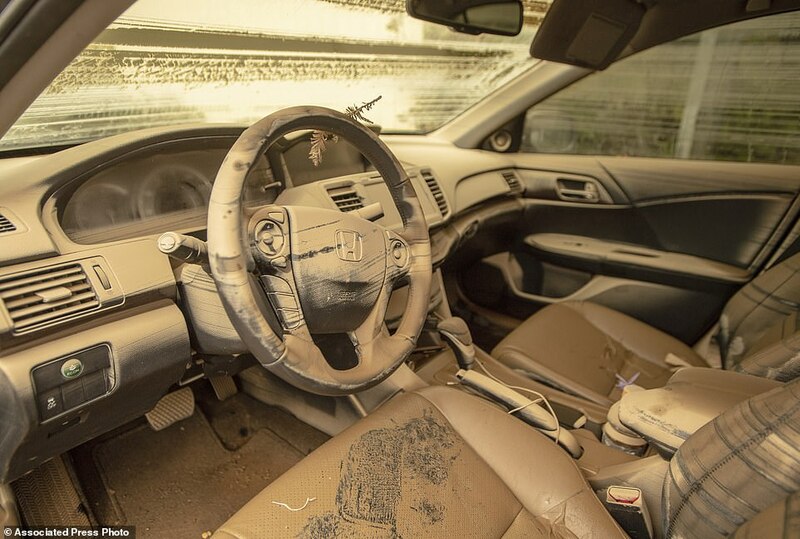 These shocking pictures show just how widespread the flooding in California's wine country was this week with thousands of homes and business facing ruin by the heavy rain. 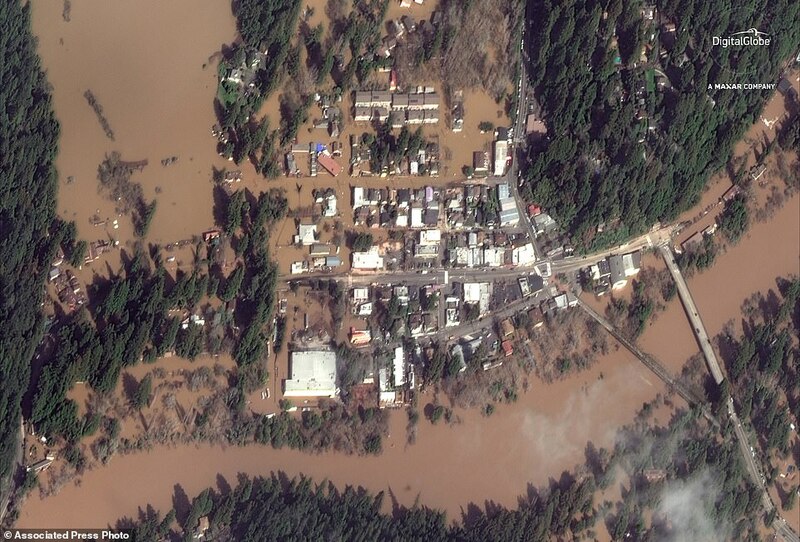 Residents were told to leave the area and roads were closed after buildings in the popular tourist destination were flooded by water up to eight feet deep. 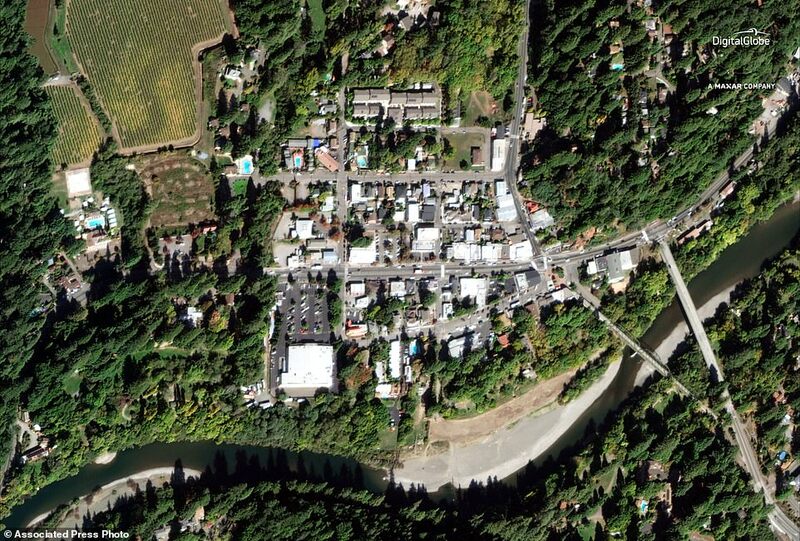 Two towns - Guerneville and neighboring Monte Rio - became 'islands'. 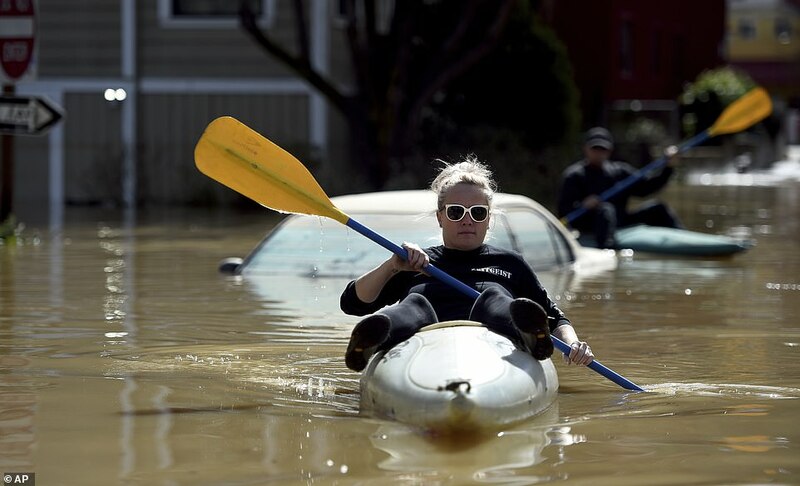 Images show people forced to kayak down flooded streets after days of heavy rain left some areas reachable only by boat after being cut off by the rain-swollen Russian River on Wednesday. 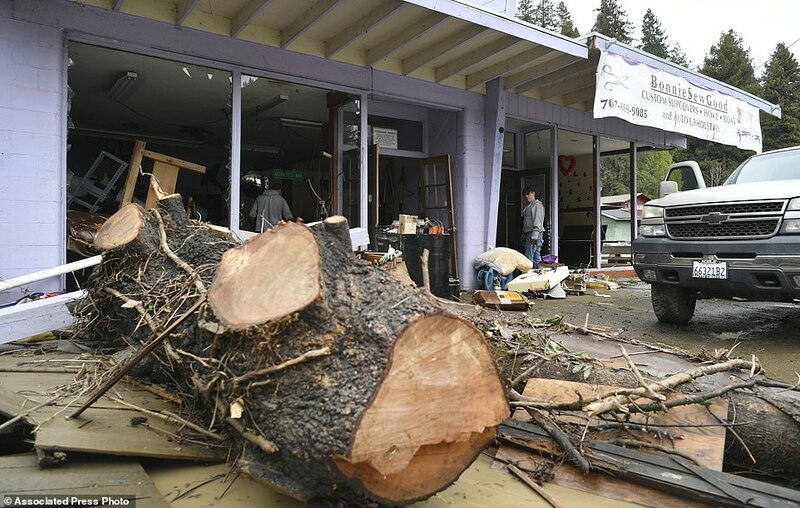 By Friday the evacuation orders were lifted and all roads into Guerneville and neighboring Monte Rio were opened - almost three days later. But residents returned to scenes of devastation and pictures from the scene show people coming to terms with the extensive damage. 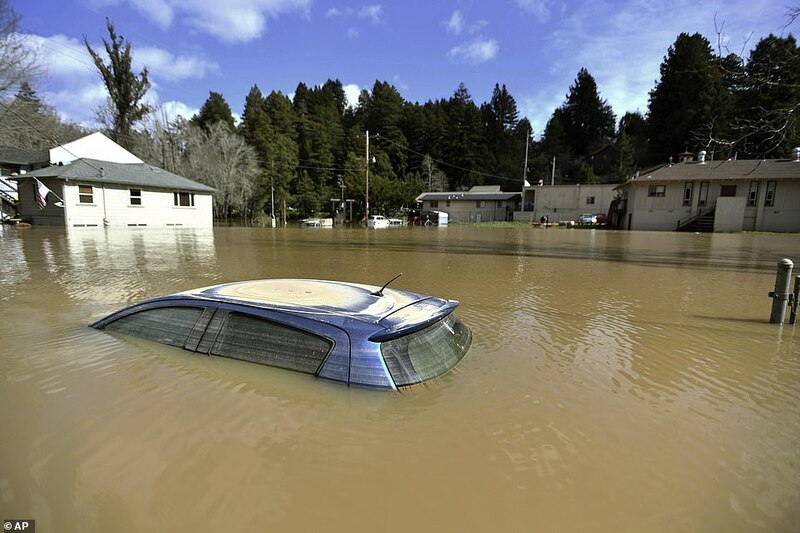 Mud and debris covers cars, homes and roads after 3,700 people were ordered to evacuate as waters reached up to eight feet deep. 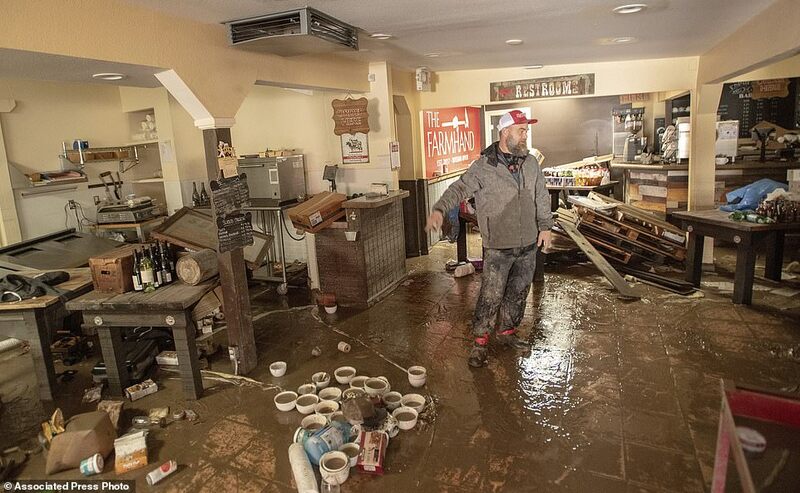 Jason Flint prepared for the flooding by putting his deli's valuable equipment on pallets and milk crates stacked several feet above the ground. 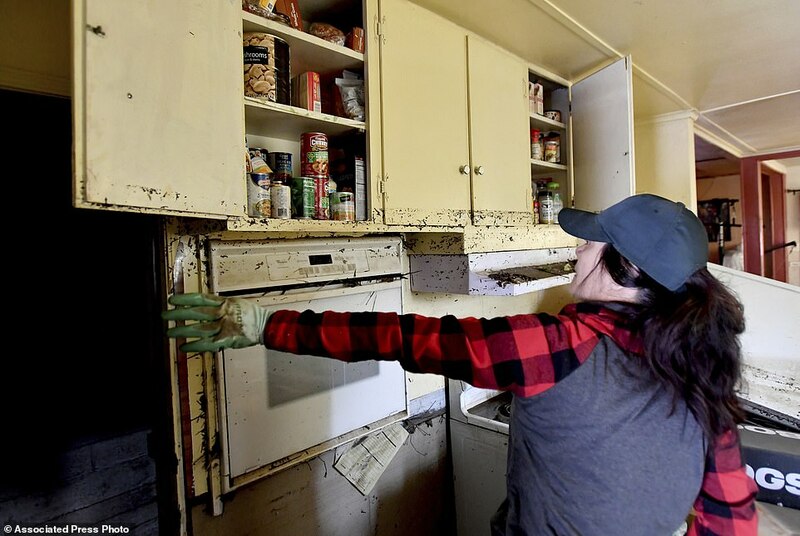 But it wasn't enough and when he returned to Guerneville Friday he found mud-covered refrigerators, display cases and food crates strewn about by 6-foot-high murky water. 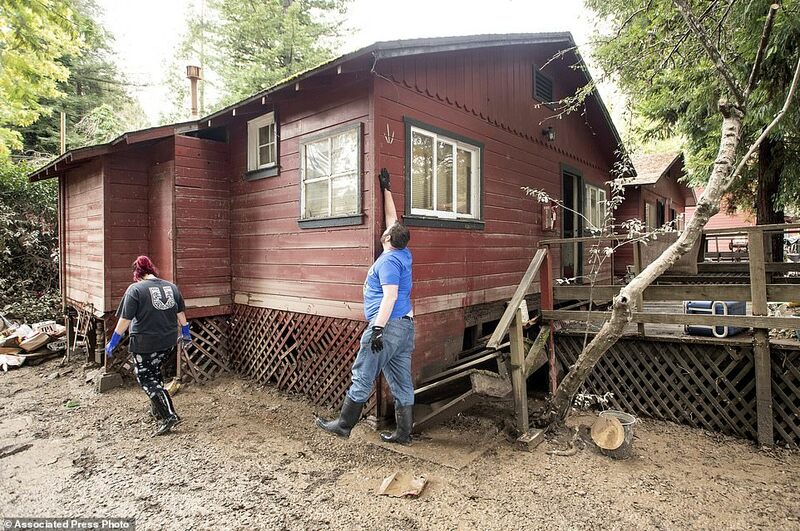 Along the main road in Guerneville, business owners inspected the damage caused by floodwaters that rose about 46 feet Wednesday night, the river's highest level in 24 years. 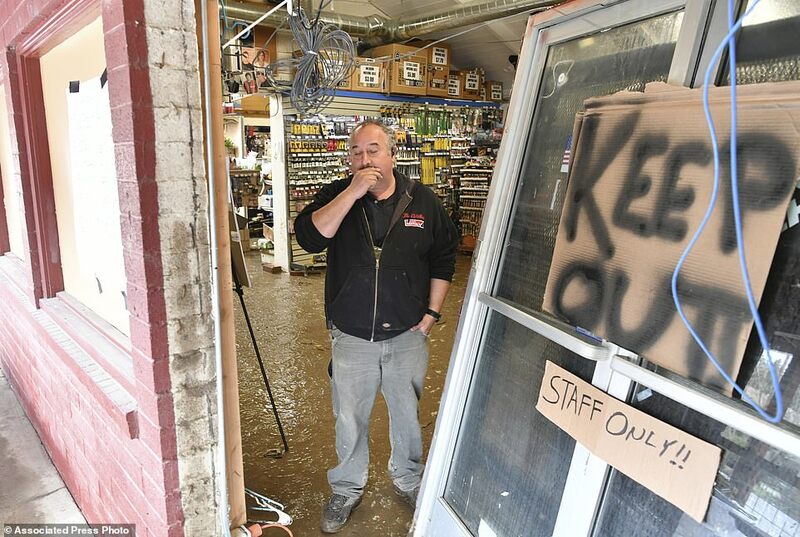 Chris Reid, a manager of True Value Hardware, said they were able to salvage cash registers, computers, chain saws and other expensive equipment by putting them on the second floor of the two-story building. But on the ground level, all the shelves were covered in chest-high mud. He and employees washed down rubber boots, brooms, shovels, buckets and other salvaged cleaning supplies and brought them to the sidewalk to sell at a discounted rate. 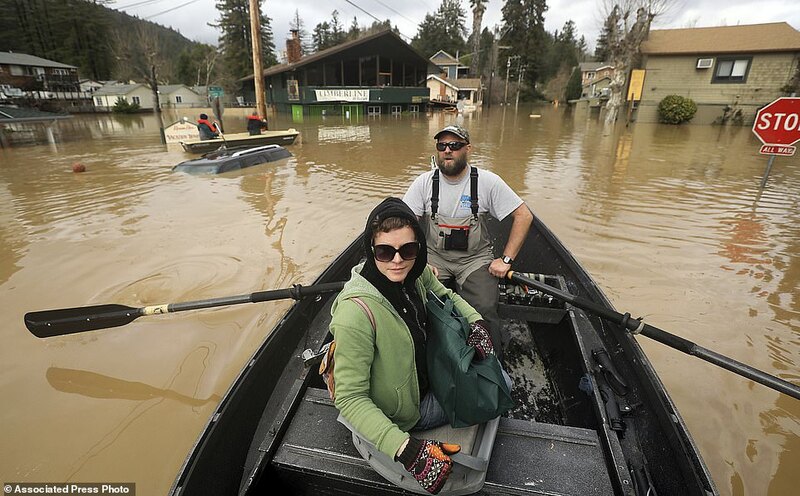 Locals are accustomed to the river flooding in rainy weather, but not like this, he said. 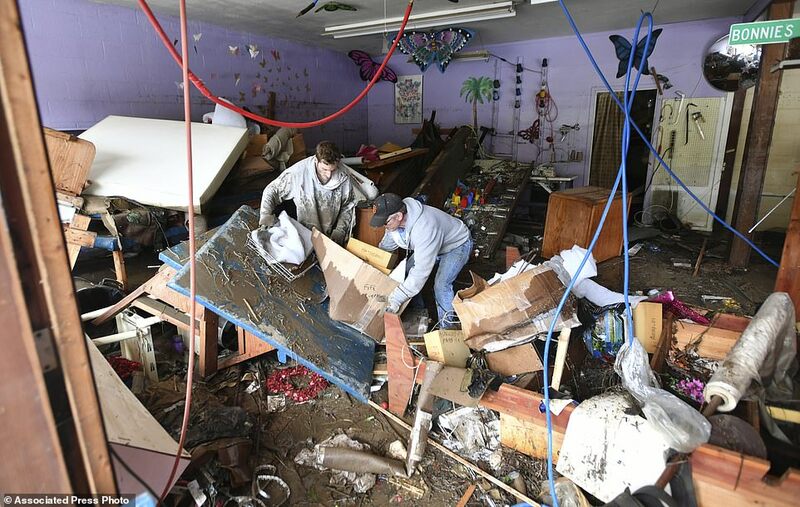 'The store has gone through all the floods but this is a lot more than we expected,' Reid said. Flint said he knew flooding was inevitable when he opened his deli but he couldn't afford to pay $2,000 per month for flood insurance. 'I've been here 17 years and I've never seen the river that high. I pray the worst of it is over,' he said, adding that he plans to rebuild his business. 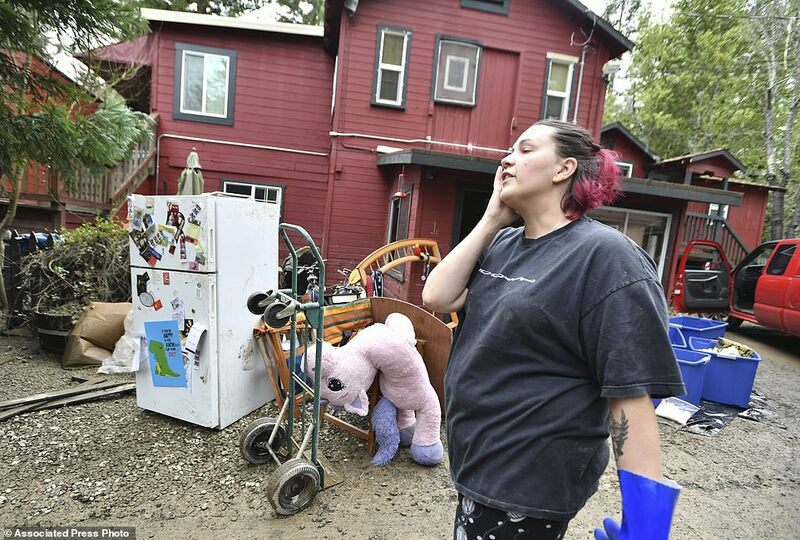 Sonoma County spokesman Hannah Euser said even though evacuation orders were lifted for Guerneville and Monte Rio, residents were encouraged to wait to enter their homes until they are inspected. Damage assessment crews planned to mark green, yellow and red tags to indicate whether they are safe for re-entry. 'We have a lot of buildings that have taken in water and we will be inspecting them to determine if they are safe,' she said. Euser said crews were still clearing trees, tires and even propane tanks from the streets while workers with Pacific Gas and Electric checked power lines. Officials warned people to stay away from the area unless they have necessary business. Light rain was forecast for Friday night in the area and Euser said emergency personnel would remain working through the weekend. She said there were continuing concerns for mudslides in areas scarred by wildfires two years ago. 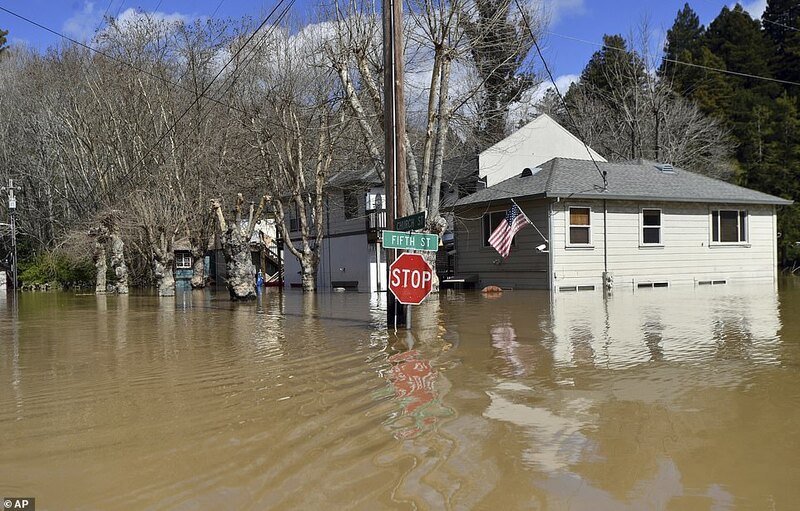 'We are not completely out of the woods here,' said Assemblyman Jim Wood, who represents the area in the state Legislature. 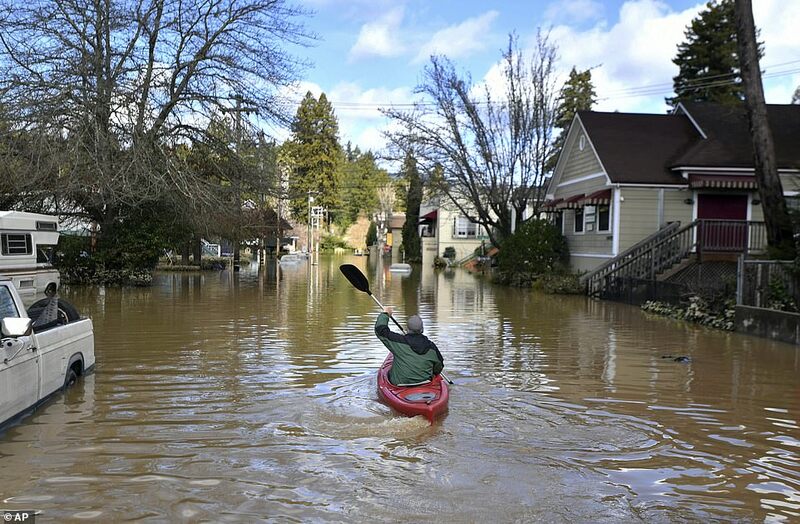 Another wet system carrying the aptly named 'atmospheric river' is in the forecast next week, though forecasters say it's expected to affect central California. 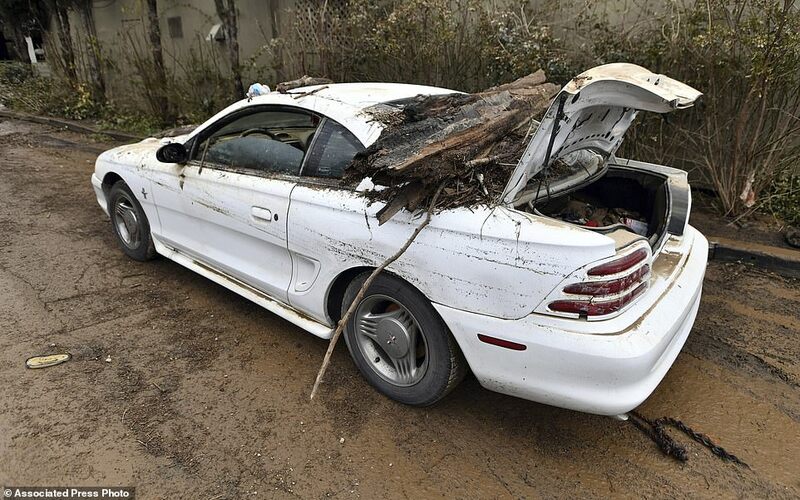 No one was injured or killed and the river receded below the 32-foot flood level. 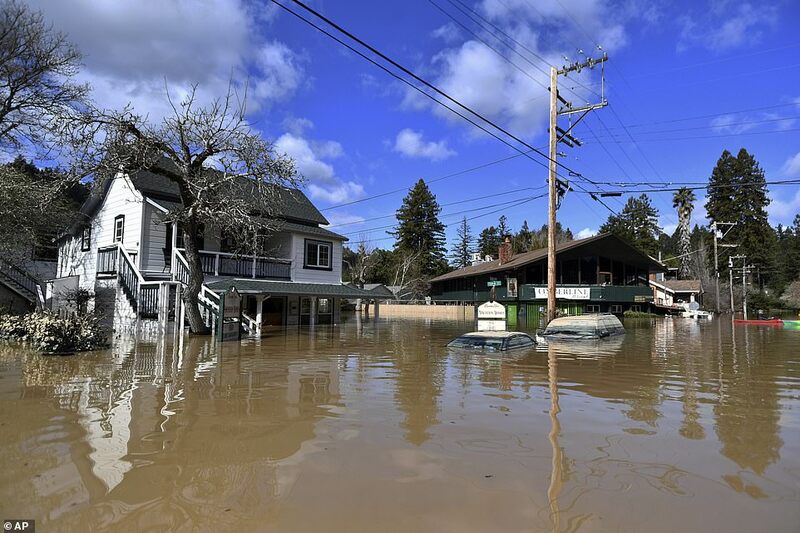 However, more than 200 miles north, a man drowned while trying to reach his Humboldt County home by walking through about 5 feet of water. Benito Nunez-Rodriguez, 35, of Ferndale was trying to walk from his job at a dairy farm to his home Wednesday evening when he was carried away by the fast-moving current, said Samantha Karges, a spokeswoman with the Humboldt County Sheriff's Office. 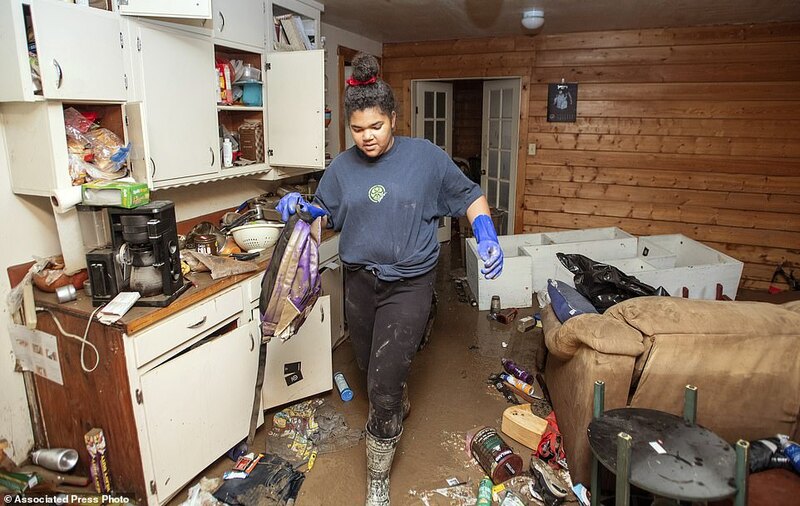 Co-workers had tried to encourage Nunez-Rodriguez to spend the night with them rather than cross the flood waters, but he wanted to get home, Joseph Alexandre, manager of Alexandre Family Farm, said Friday. 'We're all pretty shaken up about what happened and thinking what could we have done differently,' Alexandre said. will rebuild the church and pray harder. califonia is a good place to be from, Far From. It is only the start of much worse to come. I wish the unknowing well.